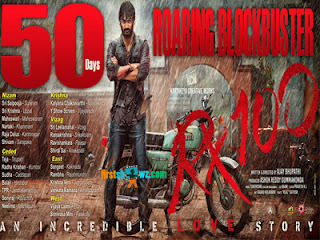 Home / News / It's a 50 for Sensational Hit RX100! It's a 50 for Sensational Hit RX100! Critically acclaimed and commercial hit RX100 has wrapped up its incredible 50 days run at the box-office. Released on July 12, RX100 went on to become a sensational hit and completed 50 days of its theatrical release in 26 theaters across Telugu States. The movie starred Karthikeya and Paayal Rajput as leads and their pairing was one of the reasons for the success. Of course the other reasons being the Ajay Bhupathi's directorial skills, screenplay and music. This bold and intense romantic drama collected over Rs 12.5 crores worldwide share making the buyers benefit 5 times the profit. RX100 has collected over 5 crore share in Nizam alone and it's still playing in 6 theaters. The movie will be remade in Tamil and Hindi versions soon.